Now don’t get me wrong. I like Ugg-boots just as much as the next bevan, but come on people! 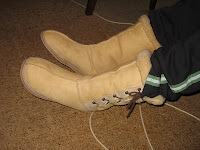 Ugg boots are an INSIDE boot, not an outside boot. This fact seems to escape a LOT of people in our new home town. Now I know residents of Brisvegas are guilty of wearing their Uggies outside the comfort of their own homes as well. In fact, I find it quite hilarious that it’s not cold enough in Queensland to wear Ugg boots with warm clothes as well, so people wear the Ugg in public with shorts and singlets! And the number of outside-Uggers increases, the further north you go! But I have to admit, the number of outside Ugg-wearers I’ve seen since we touched down in Melbourne 4 days ago has astounded me. I can’t help but point and laugh. I’ve seen Uggs over jeans, Uggs with stockings and skirts, Uggs popping out from underneath trousers, and of course, Uggs teamed with trackie-dacks. What a sight! 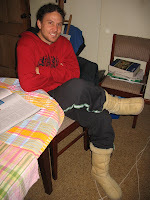 So if you are Ugg-lovers as we are, please respect the Ugg-rules and keep your Uggs indoors, where they belong. Hubs and I have been talking about starting a Blog for a while now, so here it is! Exciting, I know! We have just moved from sunny Queensland down to windy… rainy… sunny… windy… (etc) Melbourne so Hubsband can begin his course in Medicine. 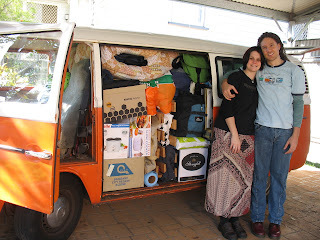 We managed to cram everything we need to live off in the family Kombi which was unbelievable and exciting! I took a look at what we had to fit in and said to Hubsband “honey, there’s no way it’s all going to fit!” To which he replied “dearest Wifey, trust me!” So I did and boy was I impressed! We had an excellent 5 day road trip down and thanks to everyone who let us crash in their spare bedrooms. We are now looking for somewhere to nest in Melbourne so we can unload the car and get on with our new lives down here.